This post is number eleven in a series during the month of December 2016, where we are reflecting on the things — issues, movements, and ideas — that give us a reason for existing here at Interference Archive. We wanted to take this time to think about what these critical elements and movements bring to us, and what we have to give to them. You can read parts one, two, three, four, five, six, seven, eight, nine, and ten as well. Socialism as a term and movement emerged in the early 1800s, both in the emergence of utopian cooperative colonies, and in workers’ movements against capitalism. Marxist thought was a major influence in the international worker organizations along with socialist ideas from Babeuf, Proudhon, Guesde, Herzen, Bakunin, William Morris, Lasalle, etc. But Marxist ideas became dominant in socialist movements. 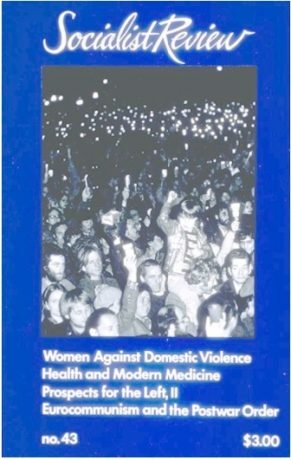 A movement grew that sought, and seeks, to overcome exploitation, alienation, and the inhumanity of the class society of capitalism. Various tendencies or schools evolved, from anti-authoritarian socialists to democratic socialists to moderate social-democrats, to democratic centralist variants of Marxism-Leninism, Trotskyism, Stalinism, Maoism, Castroism, etc. In 20th Century national liberation struggles – in Africa, Asia, the Middle East, Latin America – socialism was a major motivation. At Interference Archive, we see these threads of socialism running through so many of the movements and groups represented in our collection, and we see the importance of creating a space where all of these theorists, activists, artists, and hell-raisers who have espoused socialism can co-exist. From Engels to Rosa Luxemburg, from Einstein to Jose Carlos Mariategui, from Eugene Debs to Helen & Scott Nearing, from Joe Hill to Harkishan Surjeet, from Meridel Le Sueur to C.L.R. James, from Elizabeth Gurley Flynn to Tariq Ali, from Antonio Gramsci to Walter Rodney, from Frida Kahlo to Paolo Freire – socialism has had a wide range of thought and application. From the organizing of labor unions to the fight against Jim Crow apartheid, from the Socialist Labor Party of the 1870s to the feminist socialists of the 1970s, from the Black Panthers to today’s youth willing to campaign for an ostensibly “socialist” Bernie Sanders, socialism remains a guide and hope for realizing emancipation. Taking a longer view than the last three centuries, we see ages of struggle for freedom against oppression, ever since people were divided into classes. We can now think of these attempts at a more human society as perhaps broadly socialist. 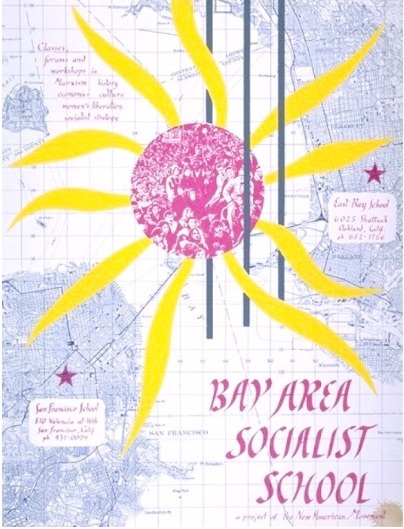 Bay Area Socialist School, a project of the New American Movement. Inkworks, 1974. African People’s Socialist Party. 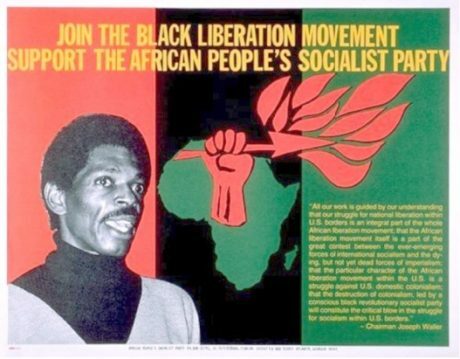 Join the Black Liberation Movement – Support the African People’s Socialist Party. Inkworks, 1980. Socialist Review No. 43. [promotional poster.] Inkworks, 1980.